Happy New Year! 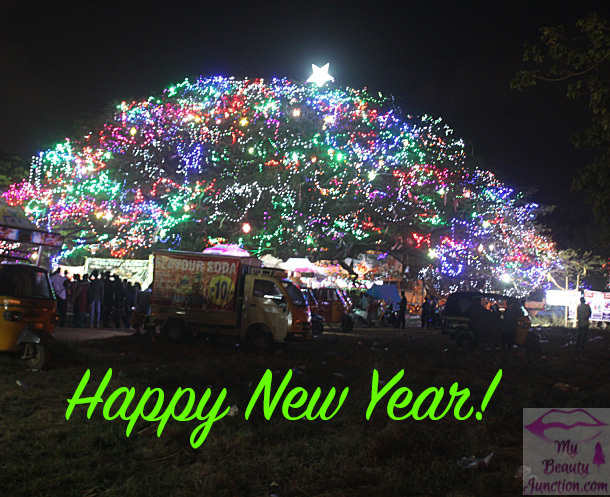 I wish each of you and your families a great start to 2015. The annual New Year Carnival parade takes place here over the course of the next 24 hours, commencing with the burning of the "papanji" (pronounced pappa-nyi) on the beach at midnight, a custom derived from the Portuguese. A giant effigy of the "papanji" is erected each year - you are seeing this year's version in the photo above, taken an hour before midnight. Each year, the Mayor or some other distinguished guest sets fire to the effigy of the "papanji", which comes the Portuguese word "pai". The "papanji" is different from Father Christmas, and stands for the old "Father Year", which has now become shabby and doddering, and must be extinguished so the New Year can be born. What can I say, when you come from a place that was colonised and/or occupied by the Portuguese, the Dutch, the Jews and the British one after the other from 1498, you must expect to be part of a cultural melting pot. The Carnival, which officially takes place over the course of two weeks from December 14, culminates in the parade on New Year's Day, which is a massive let-your-hair-down opportunity. There are tableau floats depicting the local history and culture and current events. The photo of the illuminated raintree shows the entrance to the Carnival area, which covers the whole of the Colonial part of town. Right, I'm off to soak in the atmosphere and to welcome 2015. Once again, Happy New Year! Speak to you in 2015.